In this post, I am going to show you how to make a compact, multi-purpose survival bracelet that will let you carry fire-starting tinder, snare wire, fishing line, and multi-purpose cordage all in one neat package that snaps around your wrist. Pictured below: Multi-purpose survival bracelet. To make this bracelet you will need a package of small split style key rings and another package of lanyard clips. Pictured below: Split rings and Lanyard clips. You will also need some jute twine that can be shredded apart to make fire-starting tinder, some light copper wire that can be used for snares, some mono-filament fishing line, and some general purpose hemp cordage. Pictured below: Jute twine, copper wire, mono-filament line, and hemp cordage. I found that trying to hold the materials in my hands while I was making these bracelets was a total train wreck, so I built a little jig to hold everything in place while I did the tying and wrapping. It is about seven inches (18 cm) around my wrist, so I set my jig up where it would be seven inches from the end of one split ring to the end of the other. The lanyard clip is about ¾ inch long, so when it is used to clip the bracelet on it creates a little slack and the bracelet is not too tight. 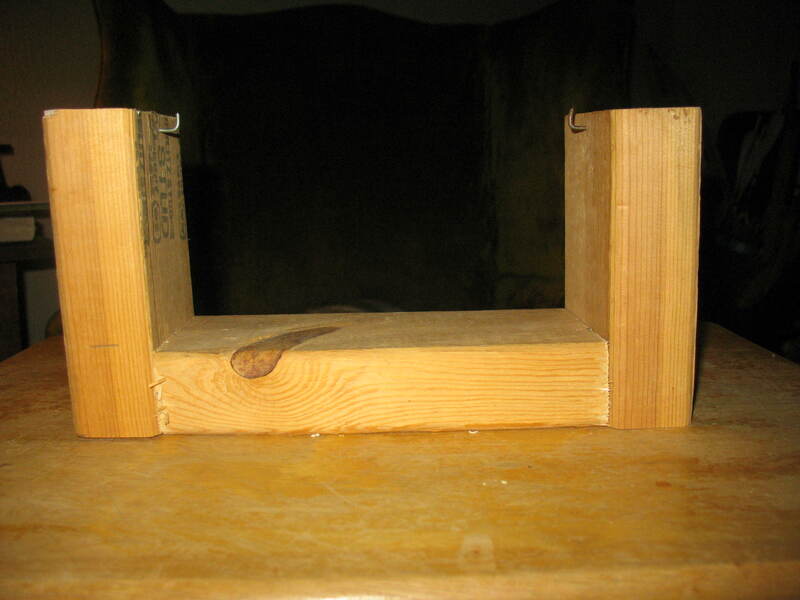 Pictured below: My home-made bracelet jig. 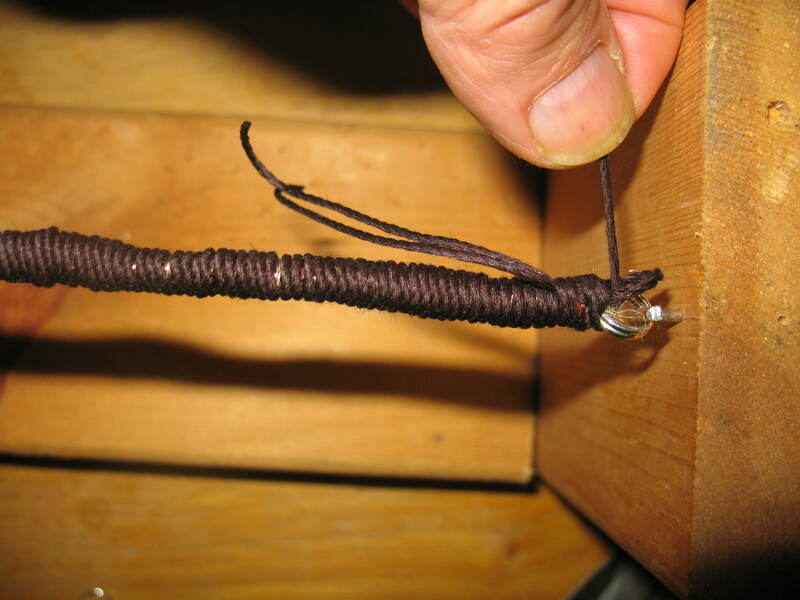 To start the bracelet cut a piece of jute twine about three and a half feet long. Please note; all of the lengths described here and below are for me and my seven inch wrist. 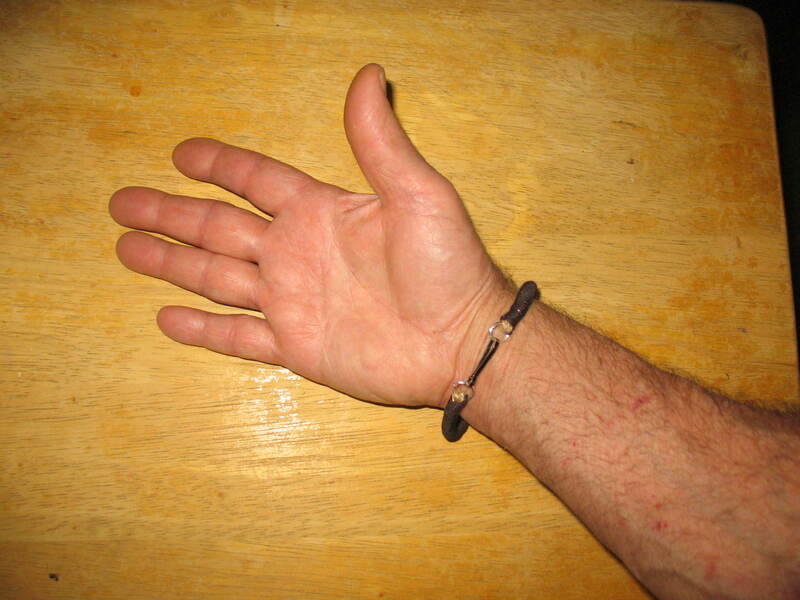 You may need to increase or decrease the lengths depending on the size of your wrist. Run one end of the jute twine through one of the split rings. Then put that split ring over one of the hooks on your jig, and hook the other split ring over the other hook on the jig. 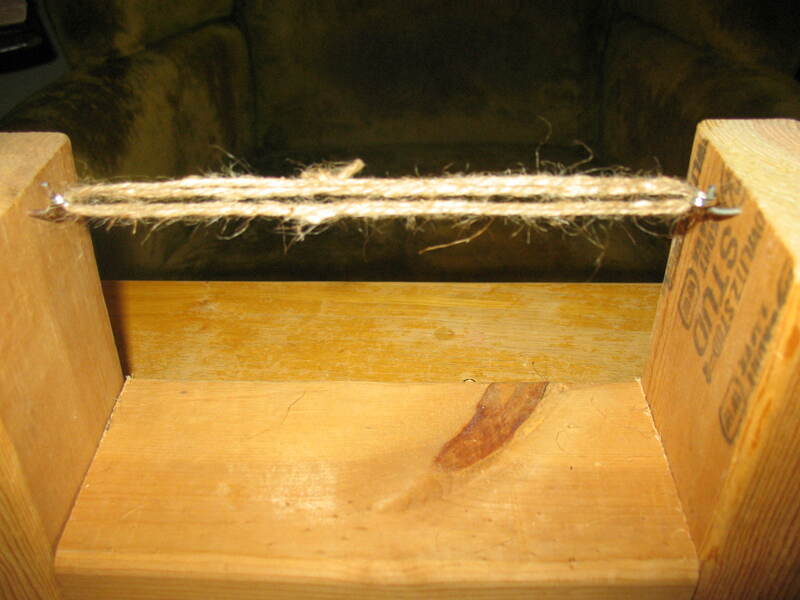 Take the other end of the jute and run it through the second split ring. 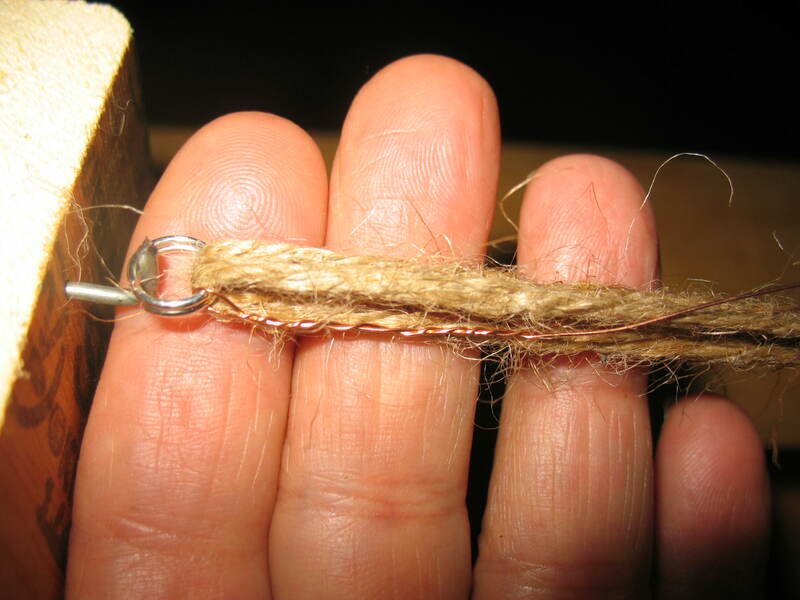 Loop it back through the first ring, then through the second ring again, then take it back through the first ring, and finally to the second ring and then tie the two ends of the jute together When you are finished you should have six strands of jute connecting the two rings. When shredded up, this should provide enough tinder to start three or four fires using your lighter or metal match. Pictured below: Jute string between split rings. 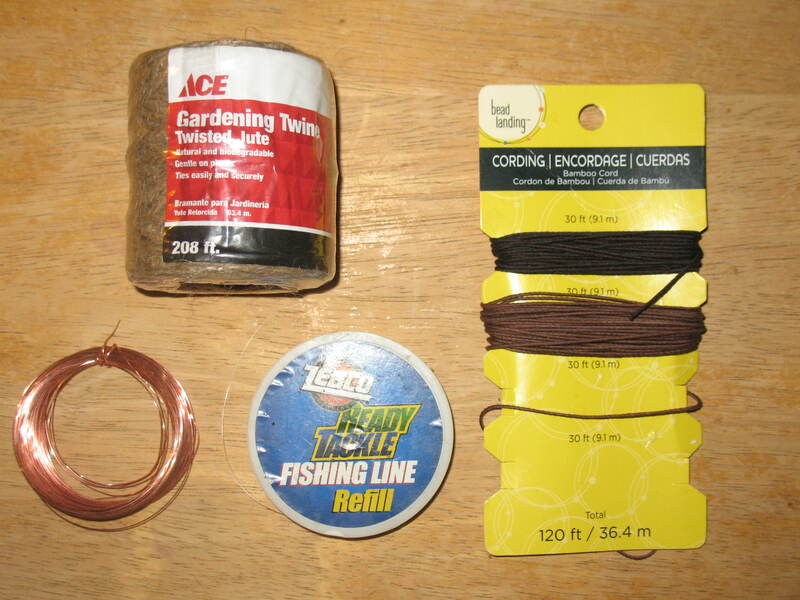 Next we are going to add our copper snare wire. You will need about 12 feet of snare wire. After you cut the wire, take some time to stretch it a little a try to straighten it out. It will want to coil back up, and it can get into a tangle pretty easily. Take about an inch of the wire, run it through the first split ring, bend it back on itself, and twist it together. Pictured below: Copper wire attached to first ring. 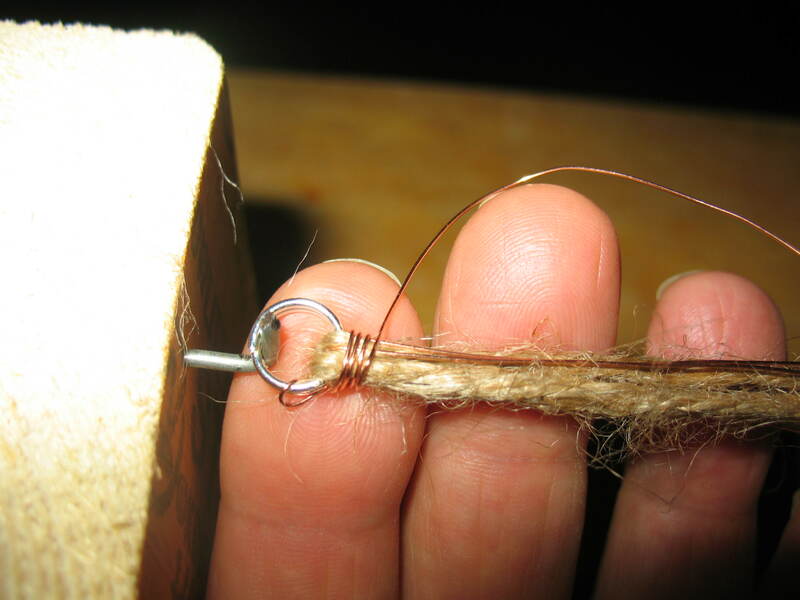 Beginning right next to the first split ring start wrapping the wire around the underlying strands of jute. Keep the wraps tight and try to lay them down neatly, right next to each other. 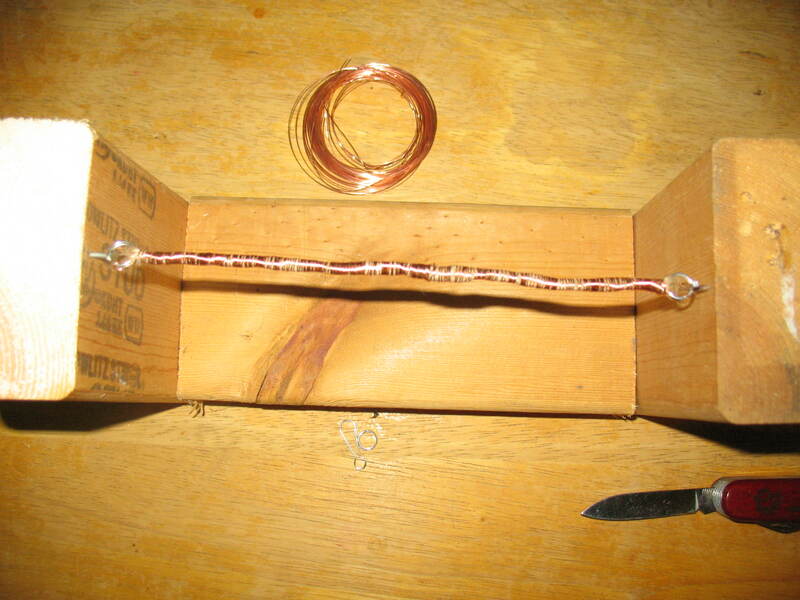 Pictured below: Wrapping the copper wire. When you reach the second split ring, stick the wire back under itself a couple of times (half-hitches) and clip off the excess. Pictured below: Finished layer of copper snare wire. Now we will add a layer of mono-filament fishing line. Cut a piece of mono about 10 feet long. This time, instead of running the line through the split rinds you are going to tie the line on below the first split ring, right above where you started wrapping the layer of wire. Make your tie with a single over-hand knot right in the middle of the mono so that you have two long strands of line hanging loose. 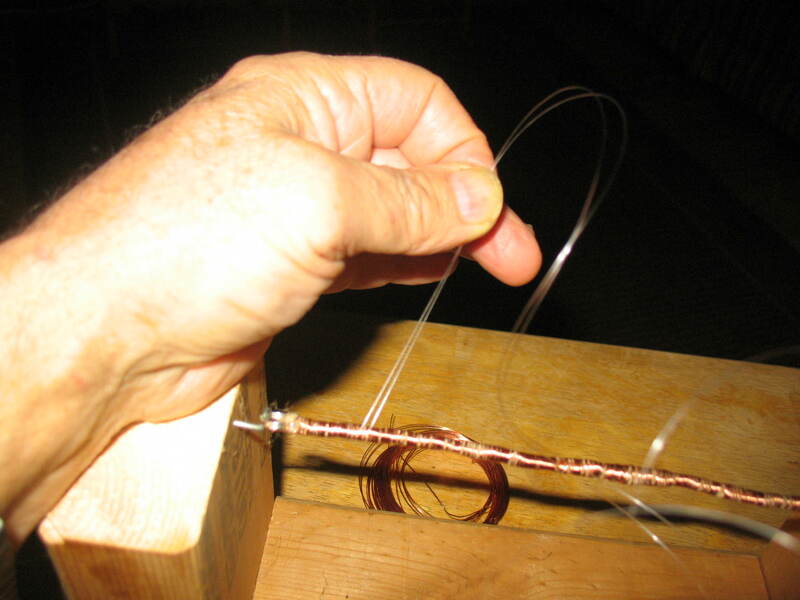 Hold these two strands together and begin wrapping them around the layer of snare wire. Try to keep them flat and even (not easy to do, but the mono is so thin that it won’t really matter). Pictured below: Wrapping mono filament line. When you reach the second split ring, take a piece of tape and wrap it around the bracelet to hold the fishing line in place. The final layer of our bracelet will be a layer of multi-purpose hemp cordage. You can buy hemp cordage at any craft store. It comes in a variety of colors. You could actually use any kind of thin cordage that you want at this point. I use hemp because it makes it look like a regular bracelet. Cut a piece of hemp about 8 feet long. 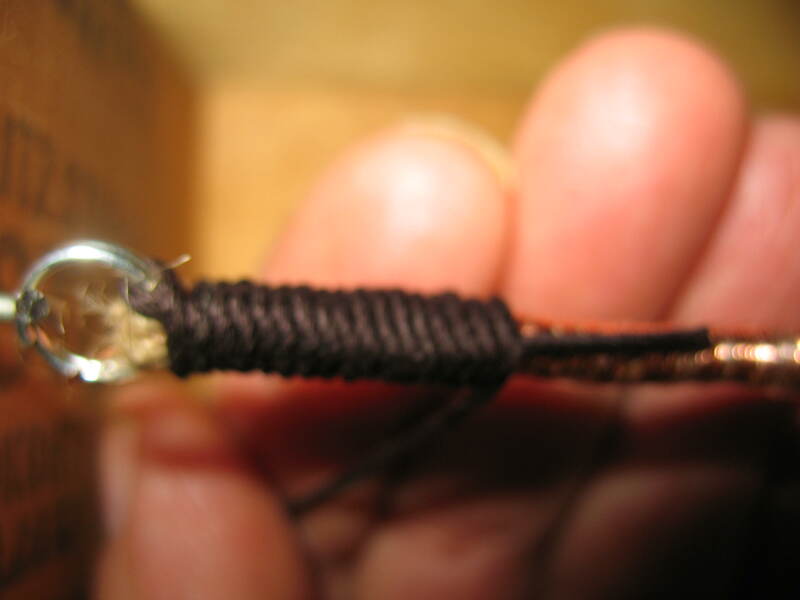 Lay the hemp on the bracelet at the first split ring with about an inch pointing back toward the second split ring. Begin wrapping the hemp, over the top of itself to hold it in place. Pictured below: Starting the layer of hemp. 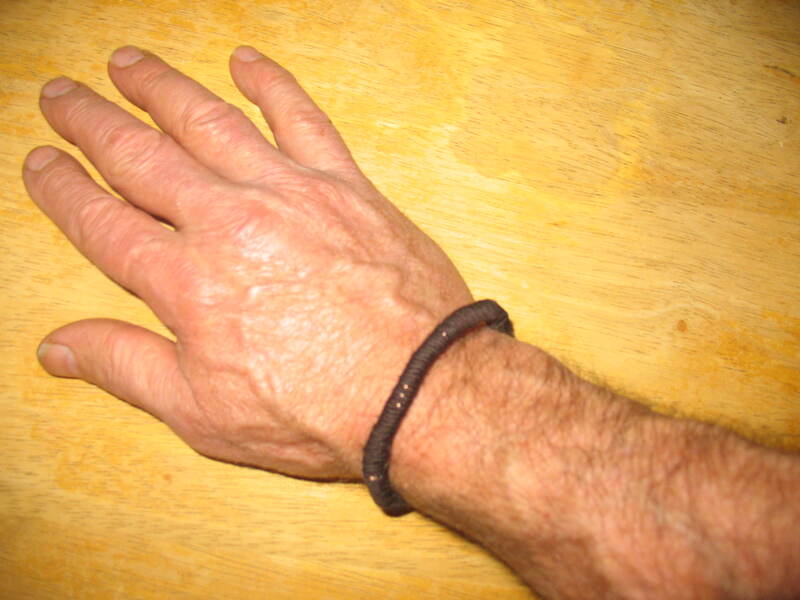 Wrap the hemp around the bracelet in tight, flat wraps that are right next to each other. When you are four or five wraps away from reaching the second ring, take a second piece of hemp and lay it down as a small, open loop on top of the bracelet with the closed end of the loop sticking out about a half inch passed the second ring. Pictured below laying down the loop. 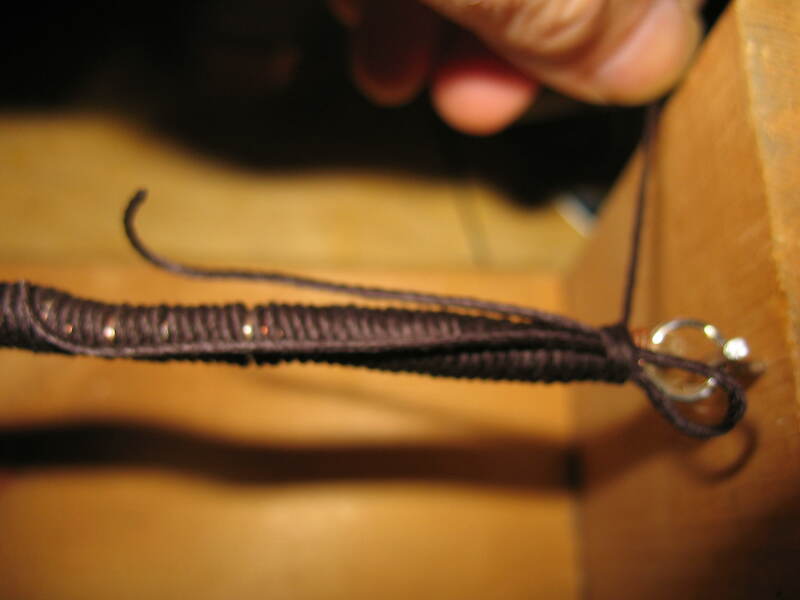 Continue wrapping the first piece of hemp around the bracelet and over the top of the loop at the same time. 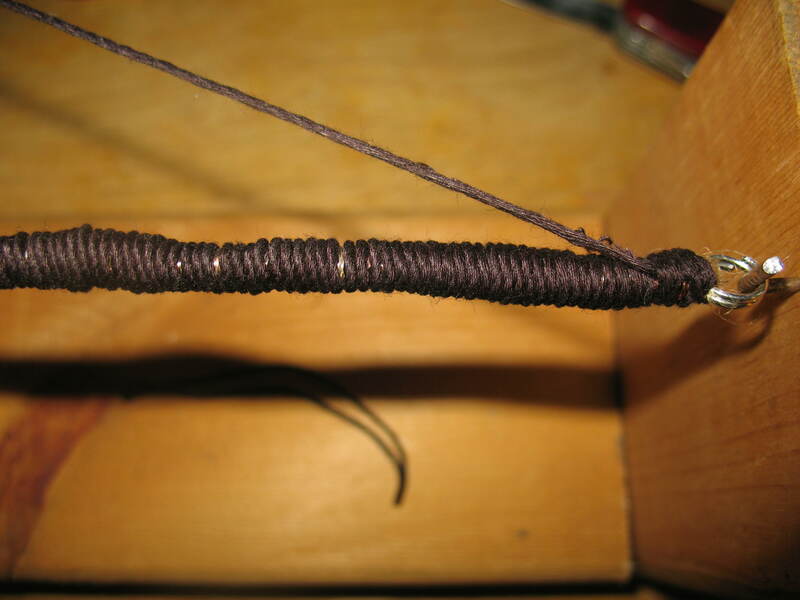 When you reach the second split ring, cut off the excess hemp leaving about two inches extra length. Push this extra length down through the closed portion of the loop. Pictured below: End of hemp pushed through loop. Now pull, gently but firmly, on the loose ends of the loop. This will pull the loose end of hemp wrapping back under the last four or five wraps. Cut of the excess. Pictured below finishing off the hemp. Your bracelet is now finished. Remove it from the hooks (if it is on too tight, you may have to bend one of the jig hooks a little to slip the bracelet off). 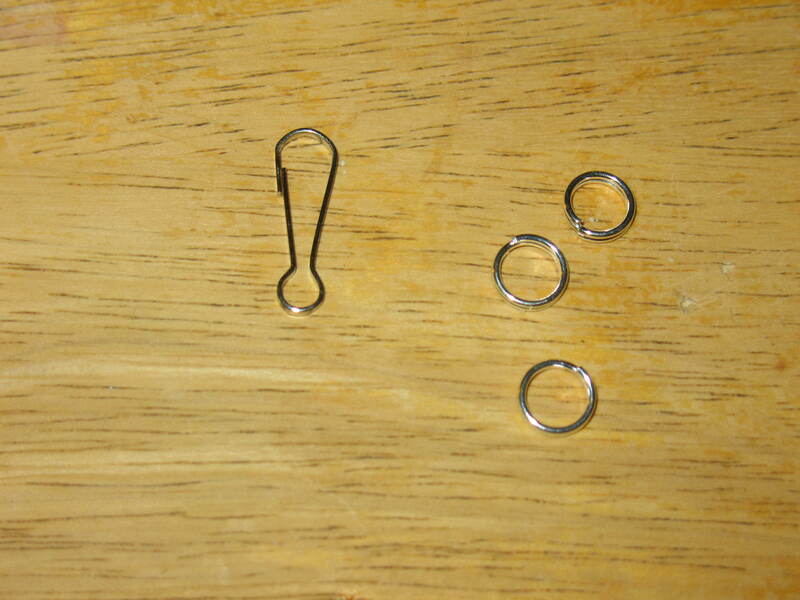 Use one of the lanyard clips to hook the split ring together. Pictured below: Bracelet hooked together with lanyard clip. If you ever get in a survival situation you can disassemble your bracelet and have access to several helpful survival tools. This tinder, snare wire, fishing line, and cordage; along with your pocket knife, lighter, and metal match could be the life saving edge that you need in the wilderness. More practical consideration. Copper’s expensive might price and try stainless piano wire instead.